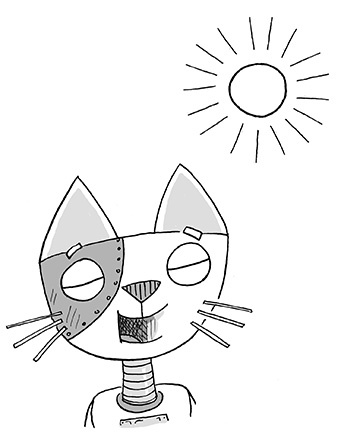 Part of the Petbots energy is provided by solar power, from the solar panels that the Professor installed on their bodies. When they sit in the sun they’re not sunbathing, their re-charging their batteris! Solar power is the conversion of sunlight into electricity. As early as 212 BC, the Greek scientist, Archimedes, used the reflective properties of bronze shields to focus sunlight to defend Greece from attack by the Roman Empire. It wasn’t until 1883 that an American inventor Charles Fritts first pioneered the idea of solar energy. Now more and more people are harnessing the power of the sun to create ‘green’ energy. The first mechanical computer, was invented by Charles Babbage in 1822. It was very different to what we think of computers today. He called it the Difference Engine, and was really a mechanical calculator. The first programmable computer was the Z1, invented by Konrad Zuse between 1936 and 1938 in his parents’ living room. In 1936, Alan Turing invented the Turing Machine, which set in motion the ideas that all modern computers are based upon. The first PC or Personal Computer that was available for anyone to buy was made by IBM in 1981 and since then computers have got faster and more powerful year after year. The first computers would fill up a massive room but today, with smartphones, people can carry them around in their pockets!